The Wolf (2017. 460 pages) is a first novel by Leo Carew, part of a new trilogy. 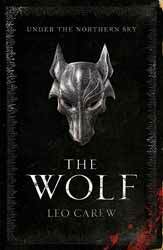 Blazoned on the cover is a quote from the Mail on Sunday declaring Carew as the next George R. R. Martin and while this may end up true it will not be with this novel. The book is structured around three seasons, summer, winter and spring, to delineate the seasons suitable for battle against those which are not. The book opens with Bellamus conspiring with his queen to get the king to agree to a military expedition north. I should point out that the story occurs in the land of Albion, so it is not so great a surprise that the map at the beginning of the novel is a stylised version of Great Britain. However, this does not constitute the main plot but becomes a subplot of a subplot and is only there to move the story forward for the main plot. Most of the story concerns Roper, eldest son of the warrior king Kynortas, ruler of the Black Kingdom, who, following the invasion of Bellamus, assembles his legions to repulse the Suthern invaders. Things do not go well for the king, who is killed in the first engagement, worst still is Roper's decision to call a retreat before the remaining army is decimated. To a martial race used to beating Suthern armies, this is tantamount to treason. At home this starts a competition for the throne between Roper, who may be the legitimate heir, and the ambitious Captain of the Guard, Uvoren. To shore up allegiances Roper marries Keturah, the daughter of a sympathetic and powerful lord. One of the great shames of the book is that Carew fails to engage with and develop his female characters. The Suthern queen Aramilla, has little or nothing to do apart from influence a weak king in Bellamus’s favour. Keturah fares a little better. While Roper is out fighting battles, she is making connections with the wives of the powerful, whether their husbands are allies or enemies, and I would have liked to have seen a little more demonstration of this soft power being brought into play. It would have made Roper's wife a more interesting character and added some much need level headed intrigue. As the main protagonist, Roper makes for an odd choice. He is so bad at taking advice or making a correct decision that you wonder if his enemies are not right to question his fitness to rule. I counted just a single decision which didn’t blow up in his face or store up more troubles for the rest of the trilogy. He only fares well as Uvoren is painted as little more than a narcissistic bully. It would have been nice to see more of the narrative from his perspective. Plastered across the bottom of the book's cover is that literary kiss of death “The next George Martin” which is a lazy way of saying that the book holds some similarities to Martin's work. The book contains no magic so far and the only thing which makes it stand out from a fictional historical novel is the fact that the people of the Black Kingdom are not wholly human with cultural differences to the human population. True, Carew is mainly interested in people and telling a story with heart and that’s no terrible thing. Also, like Martin, he is not averse to having action happen off screen. One battle is missed completely and only recounted after the victory. As a first novel I thought it good, even accepting the odd choice of Roper and his inability to either hold his temper or temper his decisions. I would certainly be happy to pick up the next novel in the series.